A computer simulation of gas (in yellow) falling into a black hole (too small to be seen). Twin jets are also shown with magnetic field lines. Black holes are thought to dominate their surroundings by their extremely powerful gravitational pull. However, other forces which are usually considered to be weaker are also at work near these objects. These include forces exerted by the pressure of the in-falling hot gas and magnetic forces. 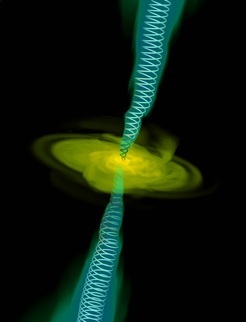 In a surprising twist, a team of astronomers at the Max Planck Institute for Radio Astronomy (MPIfR) and Lawrence Berkeley National Laboratory (LBNL) has found that in fact magnetic forces can be as strong as gravity near supermassive black holes. These findings are published in this week’s issue of Nature. Some black holes that are voraciously consuming interstellar gas also expel some of it in twin narrow outflows, or jets. This study focused on those supermassive black holes at the centers of galaxies that have observed radio-emitting jets. “We realized that the radio emission from a black hole’s jets can be used to measure the magnetic field strength near the black hole itself”, says the study’s lead-author, Mohammad Zamaninasab (formerly at the MPIfR and supported by a grant from Deutsche Forschungsgemeinschaft, DFG). “Our real aha experience came when we compared our magnetic force measurements to the force of gravity near black holes, and found them to be comparable”, he continues. Surprisingly, the magnetic field strength around these exotic objects is comparable to the magnetic field produced in something more familiar: a magnetic resonance imaging (MRI) machine that you can find in your local hospital. Both supermassive black holes and MRI machines produce magnetic fields that are roughly 10 000 times stronger than the Earth’s surface magnetic field, which is what guides an ordinary compass. The strength of the magnetic field near the black hole horizon also controls how powerful its jets are and, therefore, how luminous they appear at radio wavelengths according to current theories that treat black holes as a sort of spinning magnet. Thus, it is possible that the bright radio jets emanate from those black hole systems that have magnetic fields as strong as gravity. This entry was posted in ASTRONOMY, ASTROPHYSICS and tagged BLACK HOLES. Bookmark the permalink.